I didn’t want to write one of those “all@” goodbye emails. At best, they generate ambivalence, maybe some sadness. And maybe they generate clutter in the inboxes of people who prefer their inboxes uncluttered. The point is, they don’t seem to improve things. I’m not sending one. But I have taken the decision to leave Mozilla as a full-time employee. I’m leaving the industry, in fact. For the last 10 years, for everything I’ve learned, for the many opportunities and for the shared achievements, I’ve got nothing but gratitude towards my friends and colleagues. I cannot imagine I’ll work anywhere quite like this again. Long before I joined Mozilla, it was the organisation that had restored my optimism about the future of tech. From the dark days of the dot-com crash and the failure of platform-independent client-side internet applications to live up to their initial promise (I’m looking at you, Java applets), Firefox showed the world that openness wins. Working here was always more than a job. It has been a privilege. At their very least, Mozilla’s products are open platforms that make their users sovereign, serving as a reference and inspiration for others. And at their best, our products liberate developers, bringing them new opportunities, and they delight users such that complete strangers want to hug you (and no, I didn’t invent the Awesome Bar, but I know someone who did…). So I’ve always been very proud of Mozilla, and of proud of the work the team I’m on – Open Innovation – does. Being Mozilla is not easy. Tilting at windmills is the job. We live in times when the scale of Internet companies means that these giants have resources to buy or copy just about any innovation that comes to market. Building for such a market – as well as the inherent challenge of building world-class user experiences in the extremely complex environment of content on the Web – also means identifying the gaps in the market and who our allies are in filling them. It’s a complex and challenging environment and it needs special people. I will miss them. But thanks to the great work of our Participation Systems, and Community Development teams, contribution to the project on a volunteer basis in both technical and in non-technical areas is increasingly well facilitated. Where I’m able to and where it makes sense, I look forward to making my own contribution. As I’ve said to many colleagues, this is “thank you”, but not “good-bye”. At least, not from my side. However, this is probably my last time in the Bay Area for a while. So I took the opportunity to see some old friends (I’ve worked in this industry for over 20 years now). A common theme? Many had gone back to using Firefox since the Quantum release in late 2017. I had to disagree: it has never stopped being cool. Meant to post this sooner. I just about get through this, but I don’t quite manage to summon up the presence of the big man, whom I regard as the greatest blues guitarist of them all. Having spent a little time studying the prospects for Augmented Reality, I think it’s an extremely exciting space. The prospects for greater efficient, safety, and enhanced education experiences especially seem to be both unambiguously positive and soon within reach. Your camping trip is coming up. You and a friend go shopping for a tent. Spotting one you like, you both crawl inside to check the capacity. But there’s something unusual about this scenario: You’re in Boston. Your buddy is in Houston. And neither of you is anywhere near a sporting goods store. For instance, a virtual makeup mirror could quickly learn consumers’ preferences and show them new looks without requiring them to wait at the makeup counter. Well, it could, but that already exists and does not seem to have reshaped a great deal. (And isn’t it the expert advice from an actual human that we want?). Virtual mirrors? Meh. If you’re in the store, wouldn’t you still want to try the garment on before you buy it? I know I would. Retail’s great problem is consumers are buying online, and using retail stores as showrooms. Can Virtual Reality or Augmented Reality fix that? Seems like the lamest iPhone since the 3GS. Been on iPhone since the beginning; any reason not to defect to Samsung? And so when Apple talk of “courage”, it is not courage to make risky design decisions which will somehow free us from tangled headphone cables, or whatever other convoluted explanation Apple apologists offer. The iPhone 7 will, unquestionably, be worse for users. Apple’s courage is to use their huge market power and distinct advantages over the Android ecosystem. The iPhone is a modern day colossus, and the centre of gravity for much of the technology industry. But it will not be forever. Apple’s great challenge is to extend this hegemony. It will not do this with ridiculous wireless ear-buds, but it will by taking the lead in defining new categories of peripherals at which its platform is at the centre. As Ben Evans points out, smartphones are reaching the top of the S-Curve. Apple owns (and will continue to own) enough of the top of the market that it can force this through. The Android ecosystem is, by design, too diverse than any one vendor can follow suit. And so Apple is accelerating into the post-iPhone future, which entails risks, but offers great rewards. Rather than trying to escape, Apple are turning towards the torpedo before it can arm itself. If you care about standards, if you want technology to be equitably consumed, if you care about the environmental damage of technological waste, Apple’s courage should appall you. If you care about none of these things, and have a long position on Apple stock, you should probably be pleased. How many times will I find myself in Dallas? That thought propelled me out into the thick night air. Carpe diem and all that. And just maybe also a juvenile, morbid fascination helped. After all, I could hardly expect to learn something new about the most studied 6 seconds in history. We know Dealey Plaza from one perspective, the one Abraham Zapruder provided us with when he accidentally filmed the murder of John F Kennedy. The splendid motorcade is bathed in sunlight and the crowd is jubilant. Abruptly, JFK’s movement tell us that something is very wrong. Seconds later, our worst fears are realised as we see what can only be a fatal shot to his head. All is confirmed in Jackie Kennedy’s dreadful panic. Finally, the car whisks JFK out of the sunlight and into the darkness of the underpass at the foot of Dealey Plaza. Dealey Plaza had been built 22 years earlier. A work of the New Deal, the plaza is a memorial to the founding of city of Dallas. Like so many spaces in the US, it gives priority to cars (unlike the pleasant Klyde Warren Park in downtown Dallas), but it is still very accessible. The plaza consists of understated ornaments in a muted late art-deco style. It is a heart-shaped gateway to the city. The underpass we see at the end of the Zapruder film was that gateway. Of course, that is not how we think of it today – we think of Dealey Plaza for a violent crime and a titillating enigma. “Who killed JFK?” is byword for conspiracy theories. But unlike faked moon landings or desert-bound UFO warehouses, it raises a much deeper question: can one individual change the course of history? One version of events tells us that a single young man with a mail-order rifle manages to change the path of peace and reconciliation that JFK had put the US on. The lone gunman committed one of the world’s great powers to decades of armed stand-off, a series of bloody proxy wars, and the continued subjugation of its own ethnic minorities. The other view holds that bigger forces are at work -that such forces are always at work. They teach us that JFK’s death is part of a much bigger picture, that of the self-perpetuating “military-industrial complex”, or some other force of historical materialism. There are no happy answers. We either accept the awful thought that one individual through a single act of violence is capable of plunging the world into deep conflict (Gavrilo Princip being another example), or we hold that they are not, which is even worse. Oswald acting alone represents some form of human validation. Conspiracy wouldn’t just show that governing institutions are violent and corrupt, it begins to suggest that nothing we do really matters. I turned the right from Houston Street onto Elm, the corner of the former book depository, and I was now on the same route as JFK’s motorcade. And there it was: instantly, intimately familiar, a place I had been many times before in my thoughts. At 11:30 at night, the plaza was virtually deserted. It remains largely as it was in 1963. I drifted, almost invisible in the gloom, toward the bottom of the plaza and the grassy knoll. Climbing up to the back of the picket fence, I would greet unidentified assassins, shadows in darkness, still waiting for the coast to be clear after 50 years before they can show themselves. I moved silently to the plinth Zapruder stood on to film the president. I knew this place, I had someone else’s memory of what happened there, a memory that was more vivid than many of my own. I then found myself back at the top of the plaza, looking up at the 6th floor window. For a brief moment, there were two of us, the still shape of Oswald’s face discernible in the shadows, looking down impassively on Dealey Plaza, as baffled as the rest of us by what had taken place there. Walking back to the kerb beside where the murder took place, I looked over to my right. The underpass now is lit in vivid sodium orange. The gateway was the light. 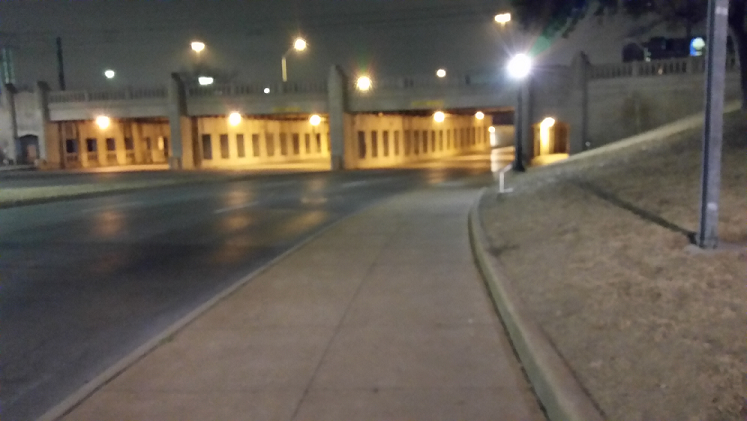 I had felt welcome, tranquil even, in Dealey Plaza, but I did not want to go near the underpass. And with that realisation, I knew my brief time as a ghost was over. Many feel that the facts of JFK’s assassination have been satisfactorily resolved. Public opinion does not agree. And the deeper questions, of course, are unlikely ever to be. But self-knowledge is also knowledge. My short trip to Dealey Plaza gave me a glimpse of Sophie’s World, a sense that I was existing in other people’s thoughts. It felt more like being in a dream than any dream I’ve been in. How do you refute Determinism? Consumers are required to use their real identify on Facebook, Google, Apple and Amazon… There is no way to stay anonymous within the deterministic ecosystems that currently exist… Each of the big four providers have integrated their own unique user identification platform into their advertising systems so that they can address ads to each consumer in a deterministic fashion. No guesswork here. They know exactly who you are. Publishers would need to set up shop within one of the walled gardens, charge for services, or slowly wither away on the small share of ad dollars they can attract…Do we want a world where only a few big media companies own the entire ecosystem for publishing and advertising? In other words, on our current trajectory, Shevach is describing a possible world where the Internet allows for no privacy and the Web offers no economic opportunity. I agree with him on all counts apart from his use of the term “deterministic”.